Every fall, my family and I enjoy finding a new, fun activity/event to celebrate our favorite season. We decided the sc arecrow displays at the Hendricks County Courthouse Square in Danville, Indiana, would be the perfect start to our fall excursions! This festive and unique annual display has become a tradition for many Hendricks County families. Handmade scarecrow displays surround the beautiful courthouse lawn all day, every day though Oct. 28. The Downtown Danville Partnership hosts this free, annual event that allows local businesses/civic organizations/families to show off their creative side! The various scarecrow displays include clever and/or humorous features that pertain to the business/organization, as well as, movie and pop culture themes. 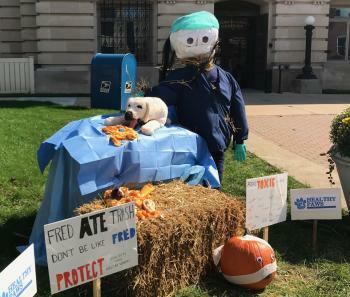 We strolled around the courthouse and viewed the scarecrow displays the first day it opened this past weekend. It was a busy day for us, but we had enough time to analyze the artistic features of each display and also take some cute family pictures. Each of us picked our favorite, which was not an easy feat, as all them were interesting and creative! The kiddos&apos; top pick was a Harry Potter-themed display. Harry Potter flying on a broom really caught their attention. After much contemplation, The Hendricks Civic Theatre display was my favorite. The theme was "A Christmas Story", very fitting as they will be performing this production in December. I couldn&apos;t help but laugh at the leg lamp and "fragile" box! My husband&apos;s top choice was created by Healthy Paws Animal Hospital. The display serves as a reminder to be conscientious of what your pets are consuming especially around the holidays. The Smokey Fireside Creations display is the main picture at the top of this post. It was my second favorite! Check out the library and NAPA Auto Parts displays and see for yourself if you think they deserved the judges&apos; top picks. 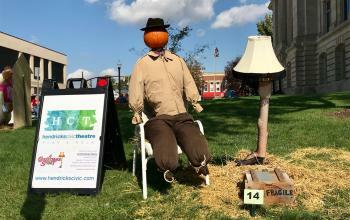 The scarecrow displays are a free, fun fall activity the whole family will enjoy. This unique event also showcases the beautiful grounds of the Hendricks County Courthouse and quaint atmosphere of downtown Danville. After you have finished your scarecrow walking tour, grab a bite to at nearby Frank&apos;s Place or the Mayberry Cafe, peruse local shops or take the kids to Ellis Park. The popular Beasley&apos;s Orchard is also just a few miles away. 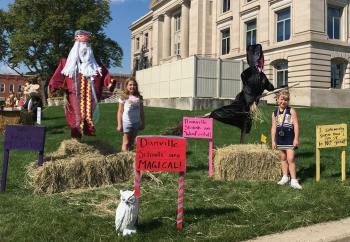 Kick off the fall season with a trip to Danville and the Hendricks County Courthouse Square to view creative scarecrow displays. Make sure to take some pictures and tag them with #inHendricks if you post them to social media.